MUST READ: Shocking Photos of a Baby Made His Mother Emotionally Break Down on Social Media! Having a baby is the most wonderful gift that a mother can have. A lot of women admit that their priorities, lifestyle and points of view change the moment they conceive and give birth. The experience is really life changing because the baby's welfare will be your top priority. 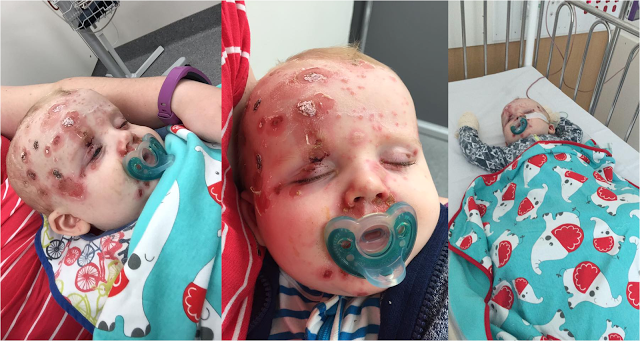 A mother from Brisbane, Australia almost broke down on social media after her baby as infected by a disease. Kayley Burke posted some photos of her 11-month old son named, Elijah. It can be observed in the photos that the baby has sores on the skin brought by chicken-pox. The infant's condition will surely break your heart. It is the responsibility of the parents to make sure that their kids will be protected from any disease and infection. Vaccination is available and there is no excuse for parents not to complete their kids' immunization.